First duty station selection is made (in either basic training or technical school/AIT/A-School), based ​upon your preferences, and the needs of the service. While the services will consider your preferences, the overriding deciding factor is where the military needs you the most. 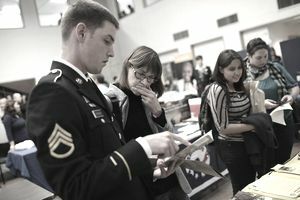 First-term (those in their first enlistment) enlisted members assigned to a continental (CONUS) U.S. location must have 12 months time-on-station before being eligible to move to an overseas location and must have 24 months time-on-station before being allowed to move to another continental U.S. location. Another type of overseas assignment, like most assignments to Korea, is considered remote. On a remote tour one cannot bring their family at government expense, and the tour-length is 12 months. On the other hand, those returning from a remote tour usually get assignment preference over those returning from a standard tour. For standard overseas tours, one can generally increase his or her chances of being selected by volunteering for the extended tour length. This is the standard tour, plus 12 months. When is assigned to a 12-month remote tour, military members can move their dependents anywhere they want to live in the United States, at government expense, while the member is away. The government must then pay again to relocate the dependents from where they are living to the new assignment when the member returns from the remote tour. Single people, even though they don't have dependents can use the follow-on program, as well. Each of the services also has procedures for hardship assignments. This allows a military member to apply for reassignment to a specific area/base, due to a valid family hardship. The military's definition of hardship is when there are extreme family problems such as illness, death, or extremely unusual circumstances that are temporary in nature and the specific circumstances necessitate the military member's presence. Both members who agree to swap must pay for their own move. This includes shipment of personal property. Usually, military personnel offices maintain lists of military people worldwide who are looking to swap. In order to be eligible for a swap, one must have the required time-on-station mentioned above. In other words, a first-termer must have 24 months time-on-station to swap with someone at another continental U.S. location. When you graduate technical school, the military will pay the authorized costs for you to go to your next duty assignment or, to the port of your military flight for overseas assignments. If you own a vehicle and get an overseas assignment, the military will either ship the vehicle for you or store it while you are away. Some locations don't allow the shipping of a personal vehicle and others restrict this privilege to certain ranks. In these cases, the military will store the vehicle for you for free while you are assigned overseas. The military will pay to move your personal property from your home location to your first permanent duty station, or, you can rent a truck, move it yourself. In such cases, the military will reimburse you a portion of what it would have paid a contractor to move the vehicle.